The Steel Greek Scorpion Shield is a beautiful custom made Greek Shield featuring a scorpion design inspired by ancient Greek art. The shield has a metallic gold background and is made of heavy dished steel. Like the traditional Greek hoplite shields of old, it is slightly concave or dome shaped, and has a flat brace attached to the back to make carrying and wielding the shield more comfortable. A heavy leather strap and metal handle are used to hold the shield. The strap and handle has been spaced and positioned to provide optimum balance when holding. The Steel Greek Scorpion Shield has also been applied with a coat of topcoat clear coat to further protect and preserve it from wear. 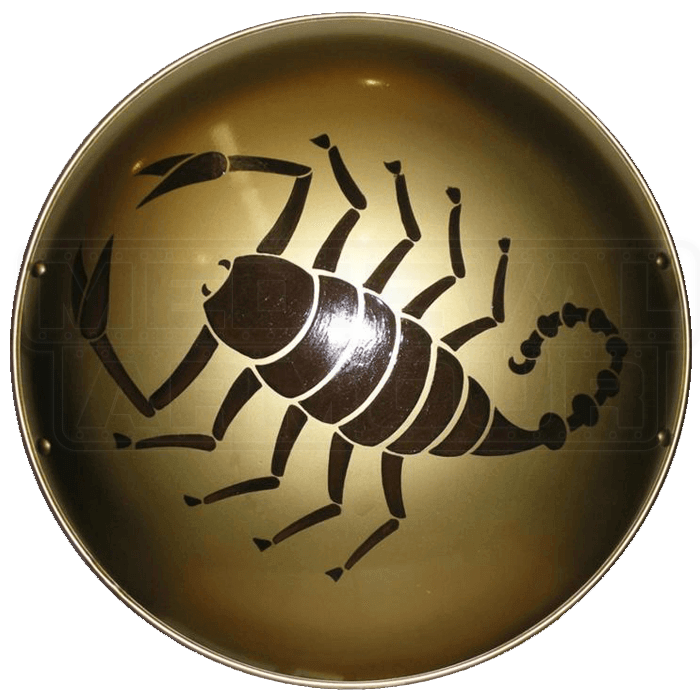 Our Steel Greek Scorpion Shield measures a large 27 inches in diameter, and weighs about 8.5 pounds.